When was the last time you had to do something that required a whole lot of effort? I can think of several things in my life that I’ve had to do that really forced me to go the extra mile and push myself to the limits to make sure that I got the job done. I had a personal goal to keep a very good GPA throughout my undergrad career. This is not easy to do when you’re trying to juggle two jobs (at one point, I had three because I was crazy). Additionally, I’d witnessed one too many other people attempt to get all of their requirements out of the way when they first got to campus freshman year,then witness their GPAs plummet at the subjects they weren’t very good at. This wasn’t going to happen to me. Nope. That’s why, by the time my first year of college came around, I had my strategy all planned out. Whereas most freshmen took the required classes that they thought they would struggle in the most first-I did the complete opposite. I took all the classes I knew that I would do very well in first. Turns out, this was a pretty smart idea because there’s a little secret that they neglect to tell Freshmen about concerning the GPA: it’s very VERY difficult to build back up once it goes down. You’re much better off starting off strong, then gradually allowing it to drop little by little rather than making it plummet right off rip then try to rebuild it back up. Which is exactly what I did. I waited until the last couple years of my undergrad years to take my math and sciences classes- which were still extremely challenging. I ended up having to take one Math class 3 TIMES. (Don’t ask,it’s still too painful to talk about). My second math class is a blur to me-all I remember was that I did a lot of praying and drank more coffee than was healthy for me. And I swear that my Statistics class was specifically designed to shave off 5 years of my life. The only reason I passed my Biology course was because I did every single extra credit assignment that my professor assigned- and I really, really REALLY didn’t like him. He was one of the most arrogant jerks I’d ever met and getting up at 8:00 am every Monday morning to listen to him lecture (literally)was just NOT fun. He was one of those teachers that liked seeing students fail his tests because it made him feel smarter. Just thinking about him now is putting me in a bad mood. I couldn’t stand him to the point where Hell would freeze over before I gave him the satisfaction of not passing his class. I definitely did. My Physics class was the last one that I had to take. It was a summer course, which meant it went much faster than normal classes during the Fall and Spring semesters.It was also an online class, meaning that we never even saw the professor besides the lectures videos he uploaded to a website.Our assignments were submitted electronically and we all had to go into a lecture hall on campus to take 3 tests, and that was it. The cool thing about the tests were that the professor allowed us to have one double sided cheat sheet that we could use. Looking back, the effort I put into my cheat sheet was kinda ridiculous. I wrote as small and tiny as I possibly could to make sure I could fit every single piece of information on the paper. And just to make sure I didn’t waste time during the test looking for the colossal amounts of information i was writing down, I eveen color coded the cheat sheet according to specific topics. I wasn’t leaving ANYTHING to chance. I was GOING to pass that class. And I did. Rather well, actually. And my GPA when I graduated? 3.527…like a Boss. 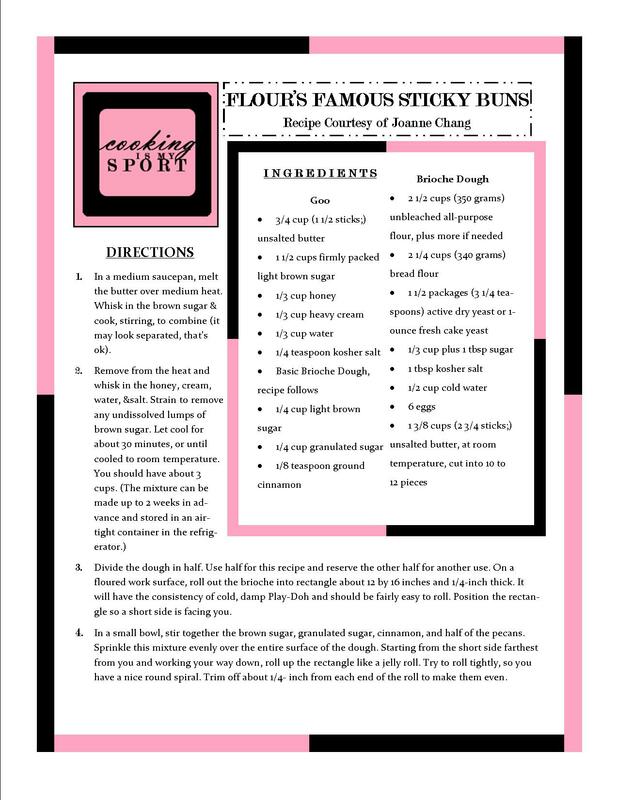 Like the cheat sheets from my ISP class, these sticky buns require a little bit of extra effort. But like the cheat sheets, they are also SOOOO worth the end result. My twin sister had been asking me to make them for weeks before I finally gave in and decided to give them a go. I’ve heard of this recipe because of the extreme popularity of the bakery, Flour that they originally come from that’s run by Joann Chang. 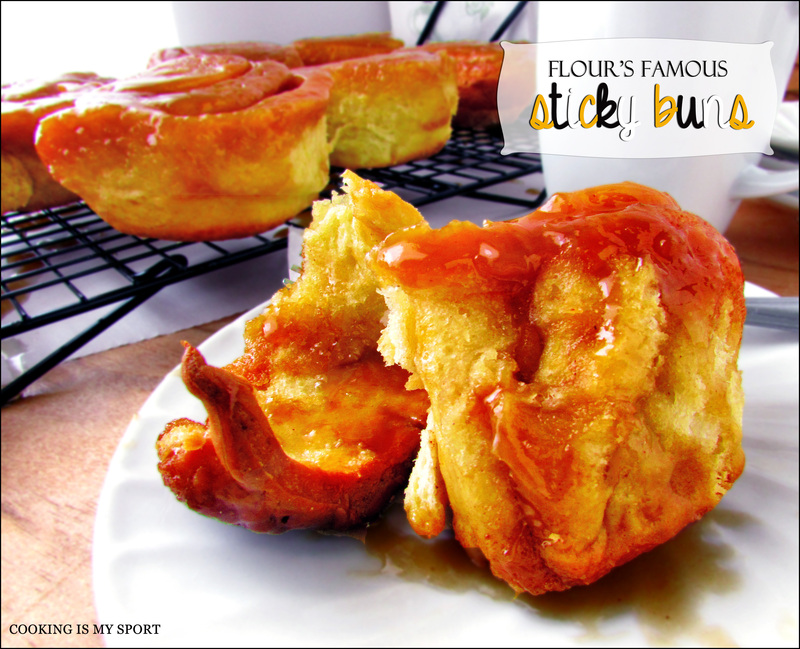 People supposedly line up and wait hours for these sticky buns…and I can’t say that I blame them. The verdict from my family was unanimous; they’re fantastic. 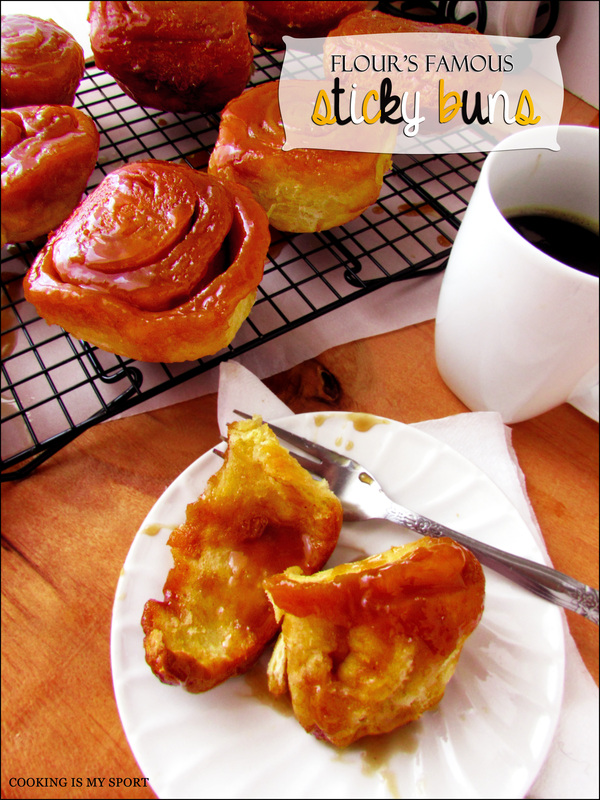 What really sets them apart from your typical sticky bun has gotta be the ‘goo’ that they’re topped with. It’s thick and gooey, but not overly sweet. The dough is what requires the extra mile, as it’s supposed to set up overnight in the fridge, but like I said, you’re not going to regret it. It’s golden, buttery and tender brioche at its best. 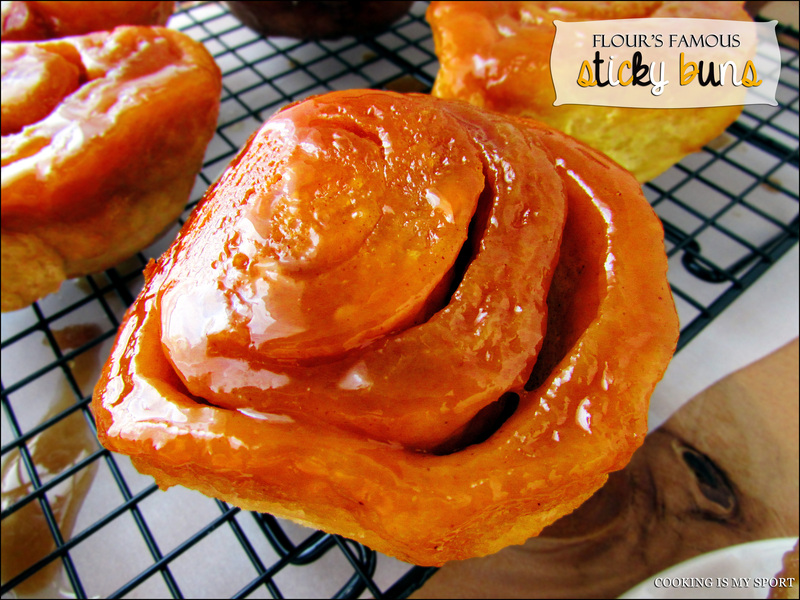 I’m taking these sticky buns to the Fiesta Friday #29 hosted this week by Angie@TheNoviceGardener and cohosted by Jhuls and Selma. I certainly hope you’ll be there to join us at the party to get one….because these babies just aren’t gonna last that long. 1. In a medium saucepan, melt the butter over medium heat. Whisk in the brown sugar & cook, stirring, to combine (it may look separated, that’s ok). 3. Divide the dough in half. Use half for this recipe and reserve the other half for another use. 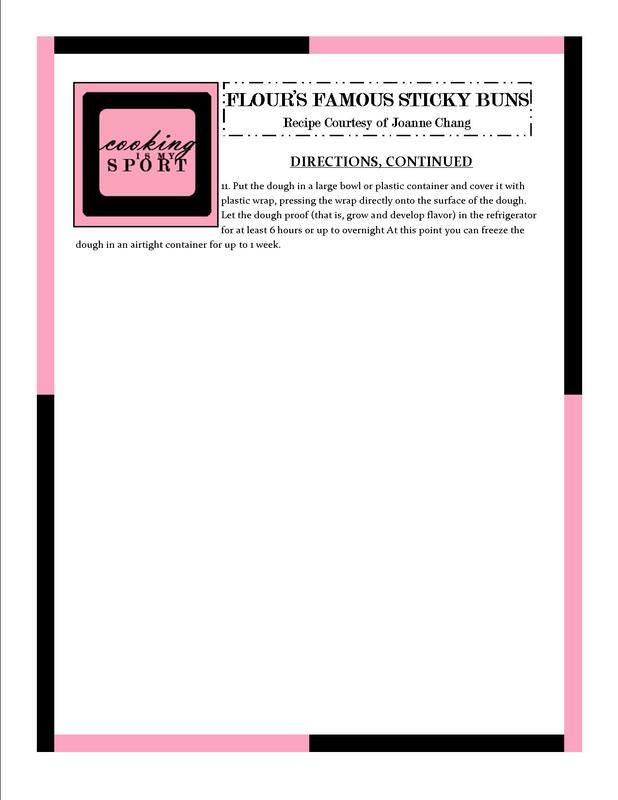 On a floured work surface, roll out the brioche into rectangle about 12 by 16 inches and 1/4-inch thick. It will have the consistency of cold, damp Play-Doh and should be fairly easy to roll. Position the rectangle so a short side is facing you. 7. Position a rack in the center of the oven, and heat to 350 degrees F. Bake until golden brown, about 35 to 45 minutes. Let cool in the dish on a wire rack for 20 to 30 minutes. One at a time, invert the buns onto a serving platter, and spoon any extra goo and pecans from the bottom of the dish over the top. 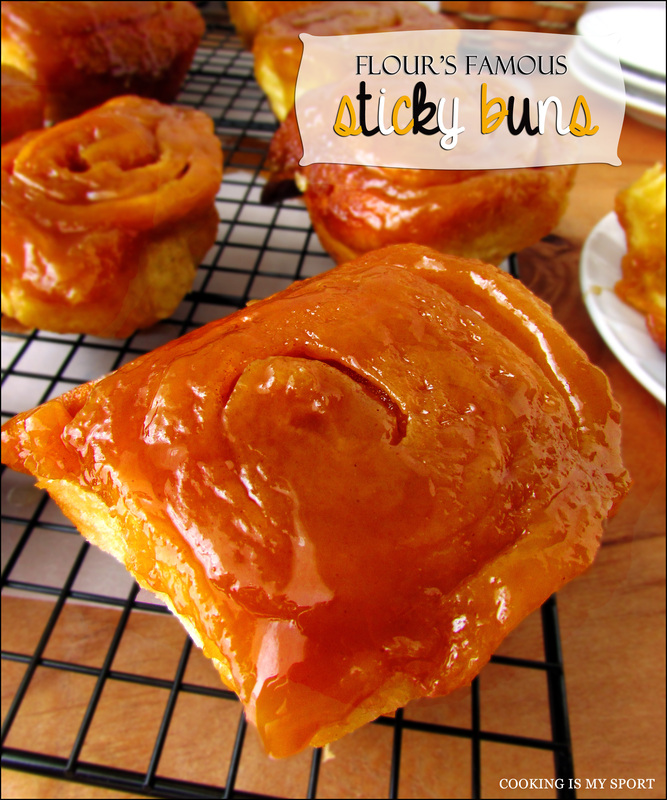 The buns are best served warm or within 4 hours of baking. They can be stored in an airtight container at room temperature for up to 1 day, and then warmed in a 325 degree F oven for 10 to 12 minutes before serving. 8. Using a stand mixer fitted with the dough hook, combine the all-purpose flour, bread flour, yeast, sugar, salt, water, and 5 of the eggs. Beat on low speed for 3 to 4 minutes, or until all the ingredients are combined. Stop the mixer, as needed, to scrape the sides and bottom of the bowl to make sure all the flour is incorporated into the wet ingredients. Once the dough has come together, beat on low speed for another 3 to 4 minutes. The dough will be very stiff and seem quite dry. 9. With the mixer on low speed, add the butter, 1 piece at a time, mixing after each addition until it disappears into the dough. Continue mixing on low speed for about 10 minutes, stopping the mixer occasionally to scrape the sides and bottom of the bowl. It is important for all the butter to be thoroughly mixed into the dough. If necessary, stop the mixer occasionally and break up the dough with your hands to help mix in the butter. 10. Once the butter is completely incorporated, turn up the speed to medium and beat until the dough becomes sticky, soft, and somewhat shiny, another 15 minutes. It will take some time to come together. It will look shaggy and questionable at the start and then eventually it will turn smooth and silky. Turn the speed to medium-high and beat for about 1 minute. You should hear the dough make a slap-slap-slap sound as it hits the sides of the bowl. Test the dough by pulling at it; it should stretch a bit and have a little give. If it seems wet and loose and more like a batter than a dough, add a few tablespoons of flour and mix until it comes together. If it breaks off into pieces when you pull at it, continue to mix on medium speed for another 2 to 3 minutes, or until it develops more strength and stretches when you grab it. It is ready when you can gather it all together and pick it up in 1 piece. 11. Put the dough in a large bowl or plastic container and cover it with plastic wrap, pressing the wrap directly onto the surface of the dough. Let the dough proof (that is, grow and develop flavor) in the refrigerator for at least 6 hours or up to overnight At this point you can freeze the dough in an airtight container for up to 1 week.